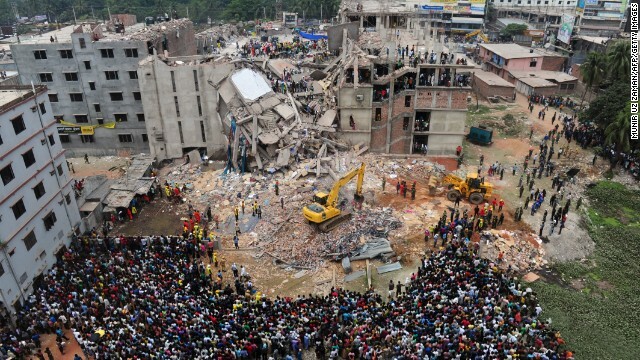 Pope Francis: Worker exploitation "goes against God"
Savar, Bangladesh (CNN) - Pope Francis, speaking at a Mass on Wednesday, made reference to the Bangladesh building collapse that killed upwards of 400 people in a sharp condemnation of worker exploitation and "slave labor." "Not paying a just (wage), not providing work, focusing exclusively on the balance books, on financial statements, only looking at making personal profit. That goes against God!" Pope Francis said. He continued: "When society is organized in such a way that not everyone has the opportunity to work, to be anointed with the dignity of work, then there is something wrong with that society: it is not right! It goes against God himself, who wanted our dignity, starting from here."